Layman here. So I have never really quite understood this facet of human evolution, (or any other for that matter), in that, I understand the evolutionary process, but I get lost on the 'border' cases. For example, we, as humans, evolved from monkeys, (to use the colloquial term, I am not a biologist by any measure). My question is, doesn't this mean that at some, discrete point, there had to have been a human, whose parents were not? If that is true, how does that work, in the sense that we now have species1 giving birth to species2. If not, then how exactly does this border case work? The only other alternative I see, is that the borders are 'fuzzy', but then that necessarily means that the definition of a species is itself fuzzy, which I understand is not the case. Actually, your last paragraph is more the case than not. 1) Phenotypically different from related species (looks or acts differently). 2) Produces viable offspring in the wild. 3) Some % of genetic difference. 1) Very easy to ascertain and measure. 2) Most common conception of a species. 3) Genes control the first two, so genetic divergence gets to the heart of the matter. 1) Is notorious for mis-labeling and missing species. 2) Some species which can mate and produce fertile offspring under enclosed conditions do not do so in the wild (Tigers and Lions, for instance). 3) The amount of divergence has, thus far, been completely arbitrary. If there is a certain % or patterns of mutation required in the genome, science hasn't yet discovered it. Yes, at some point one of our ancestors gave birth to the first Homo sapien that was somehow genetically different from its parents. However, the magnitude of the difference is probably not as great as you might think. The idea that humans jumped onto the scene with unforeseen amounts of intelligence and capability probably isn't what happened. Obviously we are capable of constructing and using the most advanced tools on the planet, but this is after several thousand generations of innovation. The very first human might have been more intelligent (or at least had the capacity to be), but otherwise probably fit in pretty well with its parents and other relatives since the vast majority of what we learn comes from our parents and personal experience. Then over time the number of individuals with the capacity for higher modes of thinking increased as a result of the genetic inheritance of whatever mutation created the first human. The first human, to put it simply, was successfully able to pass on their mutation which gave them our unique traits, and their offspring were also successful - until you have an entire population of humans living amongst each other. Eventually our innovative capacity lead, step by step, to our dominant position on the planet. Even now humans are yet evolving. Lactose tolerance (the ability to consume dairy products after childhood) is a very new trait among humans (and unprecedented among all mammals) only a few hundred generations old (roughly 10,000 years) that evolved twice in separate populations of humans (North Africa and Northern Europe). Our jaws are getting progressively smaller (which is why some people have to remove their wisdom teeth to maintain a straight smile - and some people don't have wisdom teeth at all), some muscles are disappearing (the Palmaris Longus is one example - it's present in about 80% of humans), and other subtle changes are occurring. Just don't make the mistake of equating "evolved" with "superior." Evolution is dictated by the ever-changing demands of the environments we find ourselves in, and what's beneficial today isn't guaranteed to be beneficial forever. but I get lost on the 'border' cases. Not surprisingly, since there are no borders, and this is probably the greatest misunderstanding: Evolution is gradual. It’s not generally possible to say where a complex feature (or a species) starts and another one ends. We could in theory say, for individual mutations on the genetic level, in which generation they first occurred, or when they became fixed in the population. But we cannot infer from these atomic changes where our ancestors started becoming humans. So the whole concept of “first human” is not biologically meaningful. The best analogy remains a gradient between two colours. Going from the left, where does blue end and red start? Exactly, that’s the case. For more details on definitions of species, refer to MCM’s answer. But it’s indeed crucial to note that the definition of species (or any other biological classification) is an ever-changing approximation which tries to fit a definitive yes/no answer onto a gradually changing scale. Ernst Mayr, distinguished elder statesman of twentieth-century evolution, has blamed the delusion of discontinuity — under its philosophical name of Essentialism — as the main reason why evolutionary understanding came so late in human history. Plato, whose philosophy can be seen as the inspiration for Essentialism, believed that actual things are imperfect versions of an ideal archetype of their kind. Hanging somewhere in ideal space is an essential, perfect rabbit, which bears the same relation to a real rabbit as a mathematician’s perfect circle bears to a circle drawn in the dust. To this day many people are deeply imbued with the idea that sheep are sheep and goats are goats, and no species can ever give rise to another because to do so they’d have to change their ‘essence’. There is no such thing as essence. The barrier would not come suddenly. There would never be a generation in which it made sense to say of an individual that he is Homo sapiens but his parents are Homo erectus. You can think of it as a paradox if you like, but there is no reason to think that any child was ever a member of a different species from its parents, even though the daisy chain of parents and children stretches back from humans to fish and beyond. Actually it isn’t paradoxical to anybody but a dyed-in-the-wool essentialist. It is no more paradoxical than the statement that there is never a moment when a growing child ceases to be short and becomes tall. Or a kettle ceases to be cold and becomes hot. The legal mind may find it necessary to impose a barrier between childhood and majority — the stroke of midnight on the eighteenth birthday, or whenever it is. But anyone can see that it is a (necessary for some purposes) fiction. If only more people could see that the same applies to when, say, a developing embryo becomes ‘human’. I'd just like to expand on Konrad and MCM's answers. If I understand you correctly, your main question is "what were the 1st human's parents". You cannot really get an answer to that because the question itself is wrong. The idea that evolution moves in discrete bounds, that is that speciation occurs suddenly, from one generation to the next (also known as Lamarckian evolution) has been abandoned years ago. That is simply not how evolution works (our modern knowledge of epigenetics notwithstanding). The color analogy given by Konrad is indeed a good one. So, there was never an individual 'proto human'. This is also the case for all other species. What you do get, usually, is that a change in a species' environment (e.g. temperature, atmospheric pH, the introduction of a new predator etc) causes a particular mutation, or set of mutations, to become advantageous. One has to remember that a genome (an organism's genetic material, their DNA) is not stable. It is in fact extremely dynamic and constantly undergoing mutational changes. Most of these mutations are neutral, they do not affect the organism in any way. However, when an external change such as I mentioned before occurs, some of these mutations may become advantageous. Imagine a random mutation that causes an individual of a species to be more resistant to cold. If this occurs at the beginning of an ice age, that individual is more likely to reproduce, passing the mutation to its offspring. Over time, since the mutation-carriers are likelier to survive and reproduce, this mutation will spread across the population and become "fixed". At some point these changes accumulate past a certain indefinable point and we call a speciation event. This does not occur at the individual but at the species level. A good analogy here is the sorites paradox. How many stones does it take to make a pile? So, to sum up, humans did not evolve from monkeys. Humans and monkeys at some point shared a common ancestor. Then, over a long time period, successive changes caused the two species to diverge. That is not the same thing. 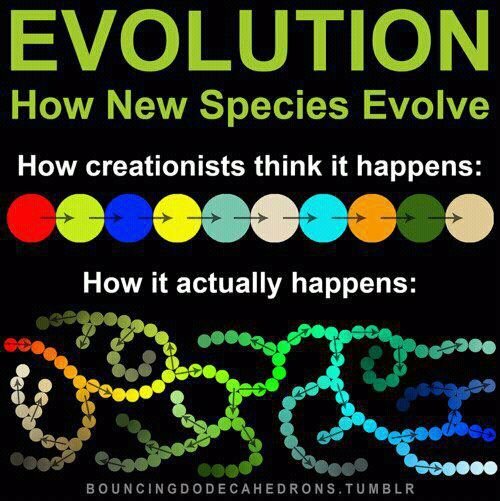 The linear concept of evolution that has one species morphing into the next is one of the greatest misrepresentations of a scientific concept ever perpetrated by the media and inflicted upon the unsuspecting public. There are a lot of good answers here, but let me try to streamline things a bit: @Konrad's analogy to the color spectrum is spot on - where does red begin in that spectrum? This is essentially your question - where in the continuum of generations does the Homo sapiens species begin? Just like our definition of color is imprecise (we usually can identify bright red and deep blue, but we cannot be sure about the shades in between), our definition of species is imprecise. We can identify a modern human and we could identify a far ancestor as such, but if we were presented with somebody from an intermediate generation, we could not confidently say if they are Homo sapiens or not. We could, arbitrarily, point to a particular individual and say it was the first human, but it would not have any scientific meaning. but then that necessarily means that the definition of a species is itself fuzzy, which I understand is not the case. The concept of species, applied at one moment (or brief period) in time, is (fairly) well-defined. It breaks down if you try to apply it over a stretch of millenia. The most commonly used definition of species is "a population whose members are capable of interbreeding with each other". (This was Ernst Mayr's definition.) So, take a group of humans and a group of chimpanzees. Humans can make babies with humans, and chimpanzees can make babies with chimpanzees. A human and a chimpanzee can't make a baby, even if they try. There's no fuzziness or ambiguity here. They're separate species. Yet we share a common ancestor. So some of our ancestors could mate with some of their ancestors. And the transition from that state of affairs to this one was fuzzy. Actually, there are indeed fuzzy cases where this species concept isn't perfect, even when applied contemporarily. A fun one is this picture. There's a horseshoe-shaped mountain range, with salamanders that live on it. Salamanders in the green bit can't mate with salamanders in the purple bit. But they can mate with salamanders in the yellow bit; and yellow can mate with red; and red can mate with magenta; and magenta can mate with purple. 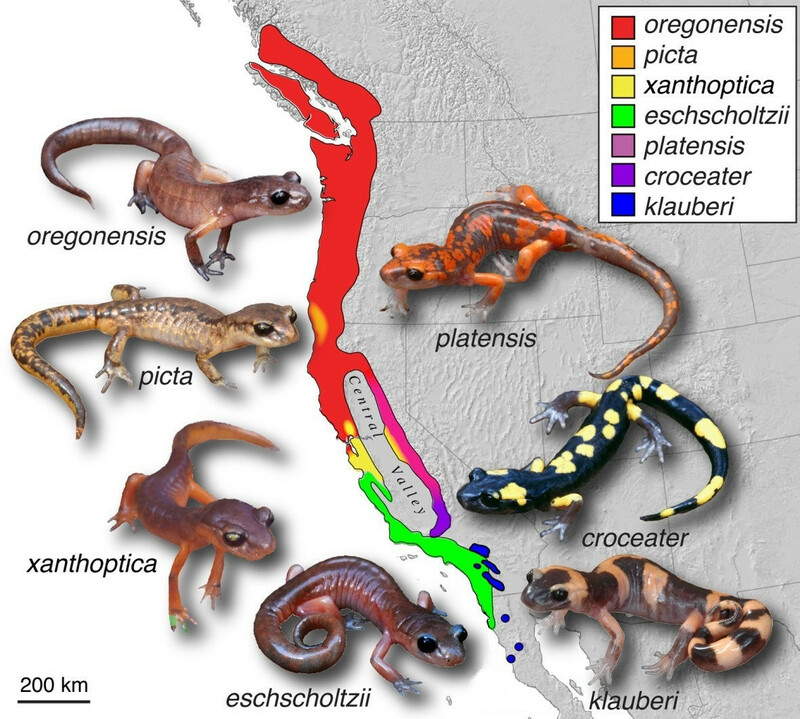 So are all these salamanders a "population capable of interbreeding", or not? And how many species are they? While the definition of species certainly is fuzzy, the process of species generation is easily defined: migration of a population part leads to two geographically isolated gene pools which do not communicate genetic information. Both pools will, through genetic drift (mutations/inserts/deletions), develop away from each other to the point that, if they were to meet again, they could no longer produce offspring with each other. Voilà, a new species. Not the answer you're looking for? Browse other questions tagged human-biology evolution taxonomy or ask your own question. How does the creative process of Biological Evolution work? Why do the ancestors of birds still exist? What is the most recent non-primate ancestors of humans? How does the modern synthesis theory explain the evolution of birds from dinosaurs? What is the most basic organism to respond to Classical conditioning (capable of learning)? How did the first self replicating organism come into existence? Could a person become physically transgender through artificial means? How did the first sexual animal come to exist? How would the human body adjust to sleep times if we were to live in a place with different day lengths?